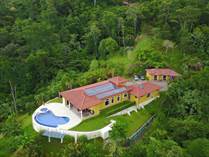 Uvita Real Estate has finished homes, developed lots, and farms for future development. The main attraction of Uvita is the sand bar and rock formation that forms the shape of a Whale’s Tail and can be seen from the properties with ocean view in the surrounding mountains. The Whale’s Tail is part of the 3 mile long coastline of protected beaches within the Marina Ballena National Park. 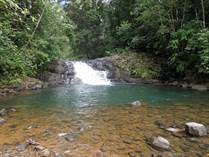 There are also waterfalls, pristine rivers, and many close beaches in the Uvita-Ballena area. Uvita also has lot of amenities with two large supermarkets, three banks, plenty of restaurants, a pharmacy, medical clinic, dentist, auto repair shops with even a Bridgestone/Firestone, gas station, and commercial centers with many shops and services available. 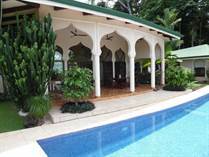 Located only 15 minutes to the South of Playa Dominical on the scenic coastal highway. "Located in a Gated community / Infinity Pool / Great Views"
" Incredible Views / Great Location"
"Developed Roads, Power, and Water System"
"Majestic Views to the Whale Tail / Near Uvita Downtown"
"Boutique Gated Community / Near Marino Ballena Nationa Park / Great Views"
"Luxury Home Overlooking the Whales Tail "
"Central location in the Costa Ballena tourism sector "
"AMAZING NEW COMMERCIAL OPPORTUNITY "
"Ocean and Mountain View 3 Master Bedroom Home in Uvita"
"A peaceful place with fresh air and nice, beautiful landscape. " "This is a rare and exceptional property in a great location!" 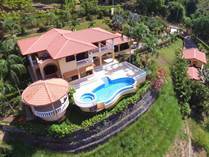 "5 Bedroom Home with Separate Guest House and Huge Ocean View 10 minutes from Uvita"
"Run Your Own Business in Paradise, Live the Dream!" "Modern 4 Bedroom Home with Whale's Tail View"
"Luxury Home in Gated Community 5 mins to Beach and Town!" "Easy Access Home Close to Everything!" 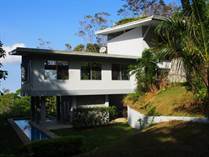 "Ocean View Main Home and Guest House with Infinity Pool"